Owing to an extensive range of applications and low-cost availability of raw materials, the Soybean chemicals market valuation was pegged at USD 25 billion in 2017, with increased consumption by the paint, coatings, printing, plastic as well as food and beverage industries. Mounting concerns regarding environmental degradation has led to the adoption of naturally sourced materials for industrial purposes. Cosmetic products made using natural ingredients are also gaining traction among health-conscious consumers, further boosting the Soybean chemicals industry penetration. Epoxidized Soybean oil is widely being used as a plasticizer in rubber processing and PVC production. Growing utilization of the eco-friendly Soybean product in the manufacturing of PVC pipes, films and floorings will additionally strengthen the Soybean chemicals market. Companies manufacturing PVC products have adopted several measures to lower their environmental impact and using Soybean derived chemicals as a plasticizer has been one of them. The global production of PVC had reached around 61 million tons in 2016 due to a rise in the demand from the different end-user segments. A significant chunk of this demand was attributed to the rapidly growing construction segment, where regions such as Europe and Asia have witnessed accelerated growth rate over the last few years. PVC pipes are extremely crucial in today’s infrastructure, as they are resistant to corrosion and are cheaper than other materials. Reports have confirmed that nearly 42% of PVC applications in 2016 comprised pipes and fittings for the construction sector. The massive consumption of PVC pipes represents the lucrative prospects available for the Soybean chemicals market, as most governments are looking to propel infrastructure development along with implementing sustainable solutions. Using a manufacturing process that is less hazardous and releases lesser pollutants is made possible by incorporating natural ingredients. The Soybean chemicals industry has been able to supply epoxidized Soybean oil to PVC companies for being used as a plasticizer to replace toxic ingredients. Disposing pipes and fittings can also lead to toxicity of the environment if the PVC is made from hazardous materials, whereas utilizing natural ingredients provides easy biodegradation of the products. According to statistics, PVC is the most extensively used polymer in construction applications, amounting to more than 75% of the applications, for warranting a life span of 10 to 20 years and more. Experts say that 60% of Europe’s annual PVC production is utilized by the construction sector in the region, making Europe a prominent target for the Soybean chemicals market. Demonstrating the tremendous opportunities for the consumption of Soybean oil by the PVC segment, it is estimated that more than 90% of all plasticizers produced in Europe are used in PVC applications. Emerging economies such as China and India also present remarkable growth potential for the Soybean chemicals industry, since using natural ingredients has inevitably become a global trend. Elaborating further, China accounted for almost USD 800 billion in the construction industry in 2017 and will grow faster than European nations over the next few years. The country also boasts of global PVC manufacturers, besides having one of the biggest agricultural output in the world which allows it to source natural ingredients. Gradual shift by pipe manufacturers towards more biodegradable PVC options is quite likely, owing to increasing land pollution as well as water pollution in nearby oceans. 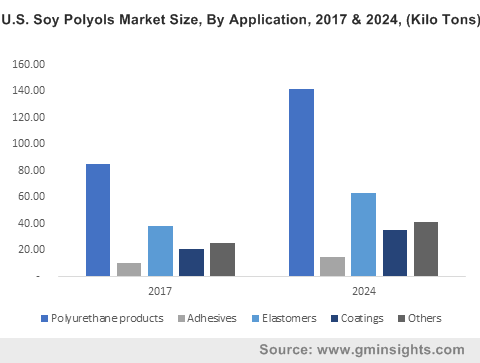 By 2025, the overall spending on construction is projected to reach USD 14 trillion, creating a large market for PVC and for the usage of plasticizers offered by the Soybean chemicals industry. As more plumbing and sprinkler systems will also be made from PVCs for reducing production and maintenance costs, the Soybean chemicals market will experience outstanding demand in the imminent future. It is estimated that by 2021 itself, the PVC market value globally will be nearly USD 72.33 billion, suggesting the incredible consumption of plasticizers by the segment. With the significance of natural ingredients gaining momentum in PVC and other segments like paints, cosmetics and fuel additives, the global Soybean chemicals market is anticipated to reach a valuation of USD 44.5 billion by 2024. The industry landscape is dominated by players like ADM, Bunge limited, DowDuPont, Ag Processing Inc. and Cargill.